Live Creating Yourself. 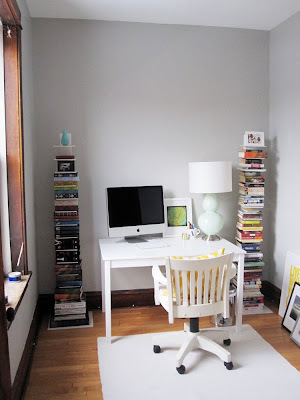 : Office space: The Big Reveal! Do we all remember what I started out with back in December...? And randomly one Sunday, I woke up, ran to the paint store, came back, and got to work. 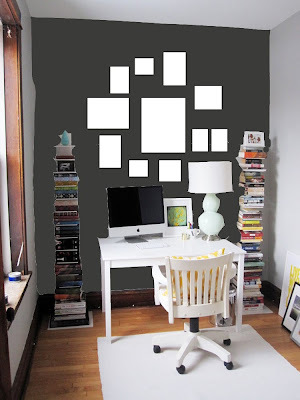 That single quart of Benjamin Moore's Black Jack was all it took to cover this small office wall. Twice over. Kind of looks charcoal grey in the photo. Intriguing. The greatest invention ever. A trimming brush. You don't even need to tape off the edges. And THAT is how you hang photos haphazardly. Grab a piece of art and a nail, and go! I really love that there is still more space on the wall to add to my personal art gallery. And here is the almost finished product! I want to spruce up that bulletin board a bit and add window treatments. 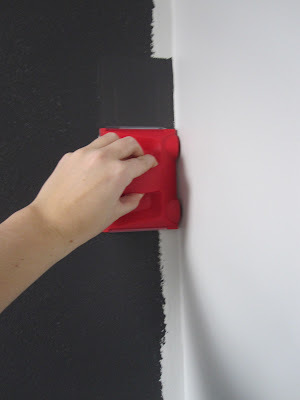 But I am awaiting higher temperatures before I can paint the trim of the bulletin board. And I'm too lazy and too broke (damn you, fabulous trip to Thailand) to go find window treatments I love. Anyway, I hope you like it as much as I do! It's so fun and pretty to sit in here and stare at all day. Which is what I do. At least 9 hours a day. 8 for work + at least 1 for blogging. LOVE it! It looks like it's out of a magazine now. You did a fabulous job. it all looks so great. 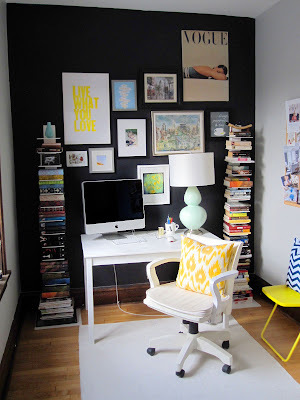 the black adds so much drama to the space and I love that yellow pillow. 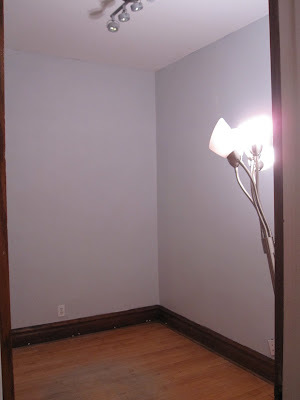 Well no wonder you do so much great blogging, graphic design, this space is SO pure and inspiring. Love it. This looks great!!! 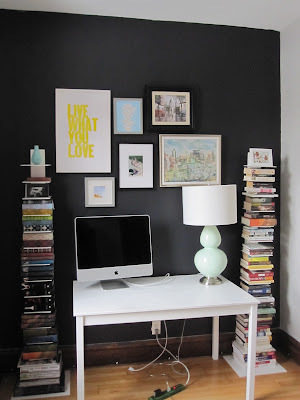 And, I love that you use the same method for hanging pictures as I do :) Such a fun little space. 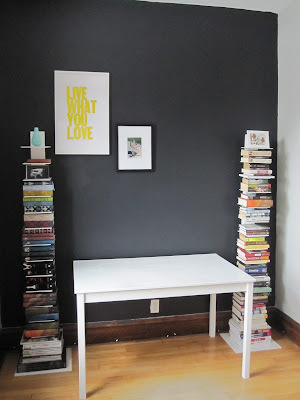 Soooo ready for my own office to be finished. Supercalifabulous! I was weary about the black but now I admit it looks really good and nice. I love what you've done! 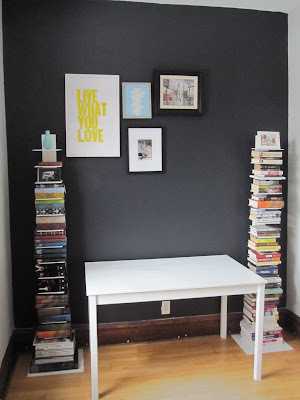 Especially the black wall and gallery art. Good work! LOVE it! Have you tried facing your desk towards the door? (It would be good feng shui. Helps with productivity, wards off boredom.) If there isn't enough space, you could put one side against the side wall. You could even have a chair on both sides. Love it! Congrats on being done with it and coming out with such an amazing space. I love the zig zag pillow too! 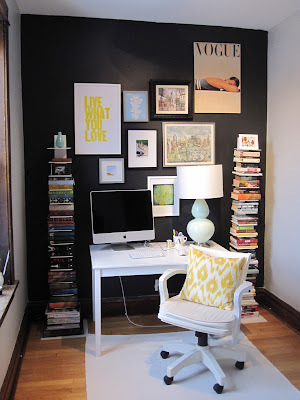 I can't wait to have an office of my own someday! Looks awesome! 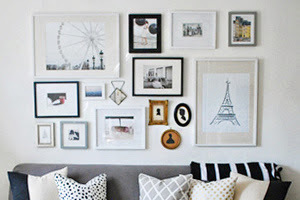 I love the "gallery" wall for all your art. Very cool. How do you keep it so clean and simple?? I have a papers problem, I have to have a filing cabinet to sort all my things and now I've outgrown my little cabinet and need a bigger one! I hardly see a single piece of paper in your space, lucky! Beautiful! I'm living vicariously through your bravery... 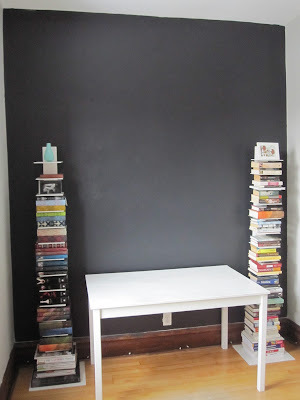 I don't think I'd ever be able to commit to a black wall, but yours looks great. And thanks for the info on the trimming brush! I've always wanted to buy one but figured they were just a gimmick! It looks fantastic! I love it! What a great before and after. 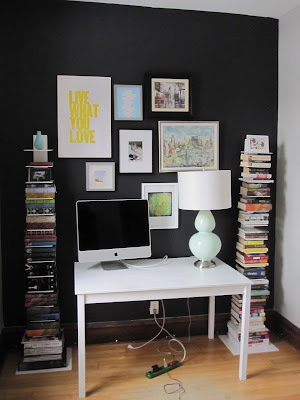 I absolutely love black walls, and the presentation of your post was inspiring. Thanks for sharing! Love the wall and the pops of yellow. You must enjoy working in such a great space! It's quite adorable. I do agree with Dawn though. 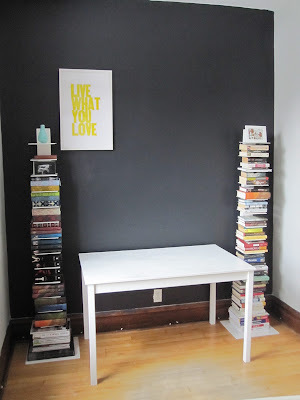 You might try using the desk in a way that isn't facing the wall. I face a wall most of the time, and I hate it, but I have no options. Of course, looking out a window is best. It looks like the perfect little apartment! Love the pops of yellow, so fresh, with the black! Good for you. Enjoy your new space! 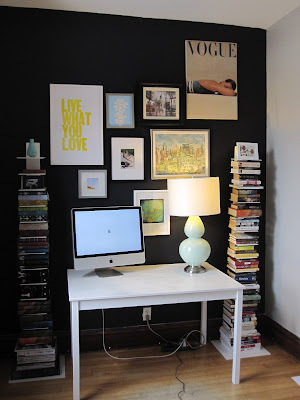 What a great home office! Very well done! 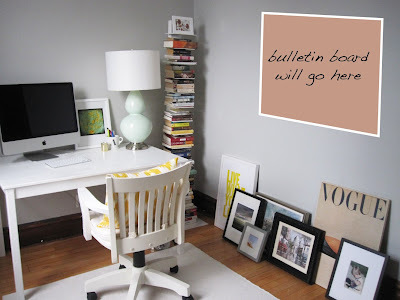 What about framing out the bulletin board to give it a little "heft"? Maybe in black? 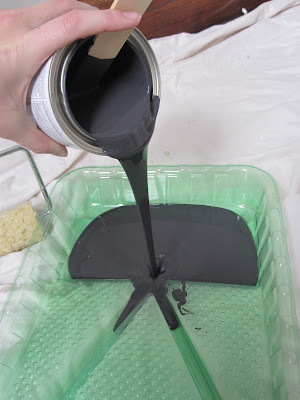 Or cover it in the fabric you use for the window treatments (or a complimentary fabric)? But why am I making suggestions? You have fabulous taste and ideas yourself! 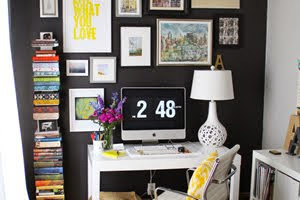 Your office looks great - where did you get the "Live What You Love" artwork? looks wonderful...love the pics leading up to the big reveal! WONDERFUL!!!! GREAT & NICE JOB!!! from Argentina, my congratulations!!!! Pls if you can tell me... what is the name of the chair?? 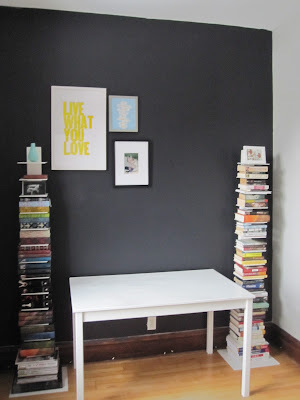 Do you know what style name of the table that is? I've been searching for the same style for a while (well, would love to have the Parsons but too spendy for now!